Leiden Special Collections Blog - Articles - No Third of October Feast without its Programme! October 3rd merry chaos in Leiden. Every year on the Third of October the city of Leiden is transformed into a merry chaos. The south of the Low Countries may have its Carnival, but Leiden and its neighbouring villages have their yearly commemoration of the Relief of the Spanish Siege. From far and wide, holidaymakers come to Leiden for a grand day out. There is an official, highly respectable part of the celebrations with speeches, marching bands, choirs and a pageant. There is also a much less respectable part with games, a funfair, foodstalls and beer, lots of beer. Traditional dishes such as stew, herring and white bread are consumed in prodigious quantities to honour the memory of this happy occasion on 3 October 1574. On that day, after having beleaguered the city for months on end, the armies of King Philip II of Spain lifted their siege, forced by inundations and an approaching fleet of Dutch rebels, both under the supervision of William of Nassau, prince of Orange. Ever since 1886, the commemoration of this historical occasion has been organised by the 3 October Society (3-October Vereeniging), founded in the same year. And indeed, few initiatives have ever enjoyed such an unparallelled success. Also from 1886, the Society published an annual ‘Feestwijzer’, or programme of festivities, to add more structure to the celebrations. One should have imagined that Leiden University Library has always been keen on collecting them, but the opposite is true: the University was always too lofty for these lower-class entertainments. Nevertheless, we have since mended our ways, and quite recently we managed to lay our hands on a run of historical ‘Feestwijzers’ for the collections of the Society of Dutch Literature (Maatschappij der Nederlandse Letterkunde), which are preserved in the Leiden University Libraries. 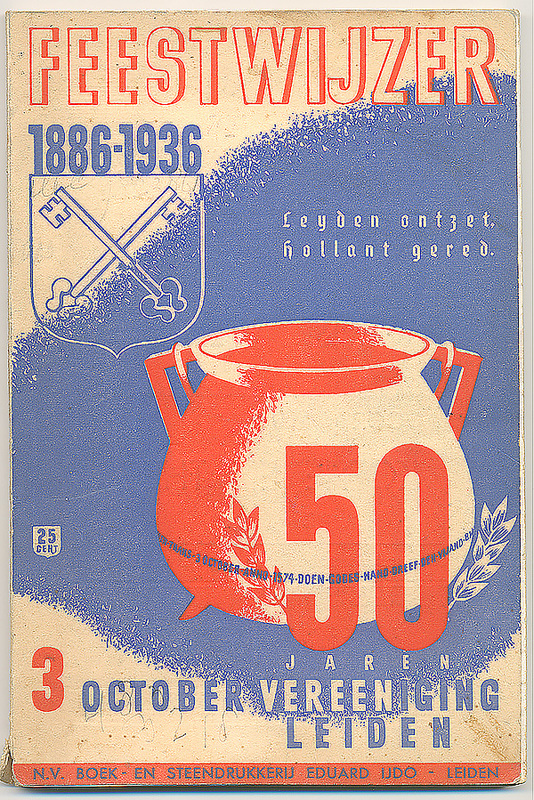 Not only the programmes themselves, but also the commercial advertisements provide a beautiful historical picture of the festivities, and how the Relief of the Siege lives forth in the hearts of the people of Leiden.